My local market happens to be in the Proctor neighborhood of Tacoma. It’s small and, I believe, relatively young. Sure, there are bigger and more populated farmer’s markets in the area. But Proctor has a neighborhood charm that can’t be found anywhere else. You really can get everything you could need or want for your seasonal cooking from its stalls. 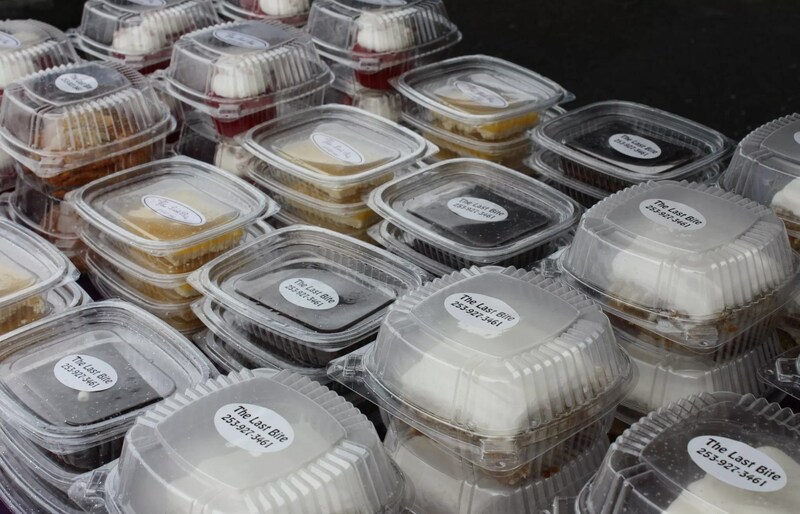 The Proctor Farmers Market opened last weekend. To my dismay, I was in LA (at the Food Blog Forum Seminar, so I deserve no pity). Today was my first chance to explore and see which vendors are back this year to share their goods. Today, it was raining, windy and 45 degrees. Yet, there were more vendors than ever. I saw returners and a few new faces that were all braving the cold, their booths blowing away in the wind. 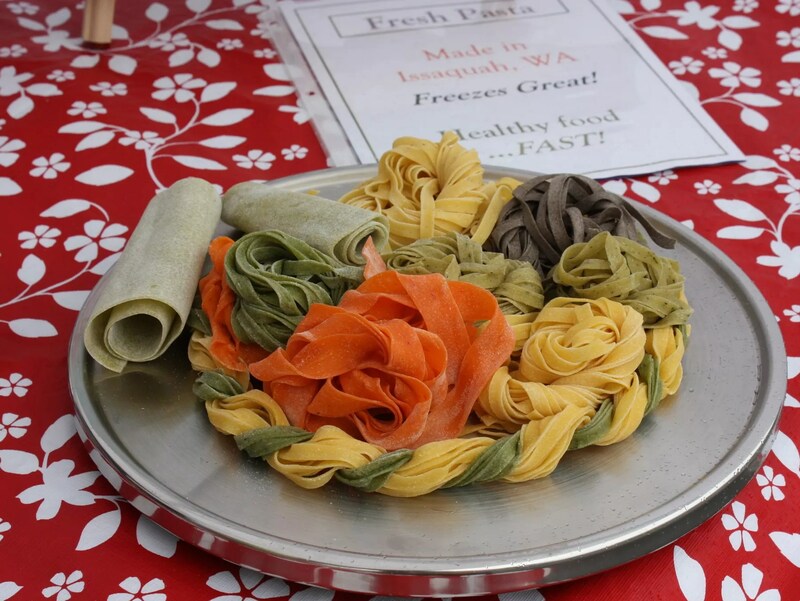 Last year I had the pleasure of enjoying Pacific Pasta’s fresh Spinach Lemon Pepper pasta. Today, I remembered just how great it was, and bought some more for dinner tonight. 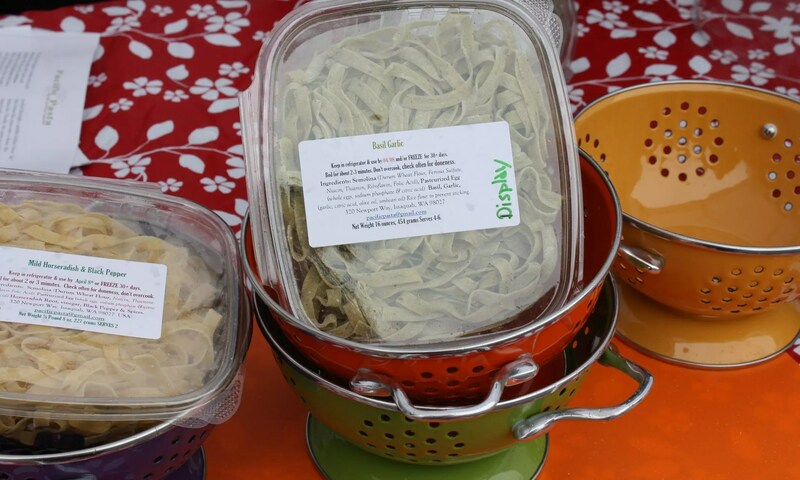 Their creative pasta flavors range from Horseradish and Black Pepper to Basil Garlic, and the list goes on. Every time I stop at their booth, they have new and exciting pastas to try. My favorite way to enjoy their fresh pasta is simply, with butter and parmesan cheese so that the individual flavor of the pasta can stand out. 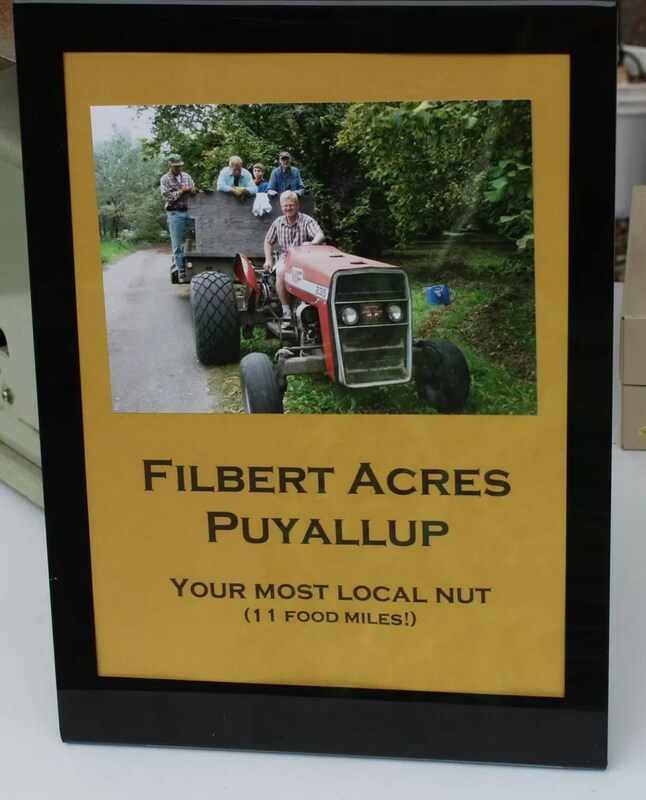 Filbert Acres is located in Puyallup, Washington, where I grew up. I was happy to see this familiar name at the market today. I did not know this, but their hazelnut trees were planted in 1947, and are still producing today. Kudos to them for staying in the Puyallup Valley, an area that has succumbed to development. Even in my 25 years of life, I have seen the Puyallup Valley go from fertile farmland filled with fields to an area filled with housing developments and commercial buildings. 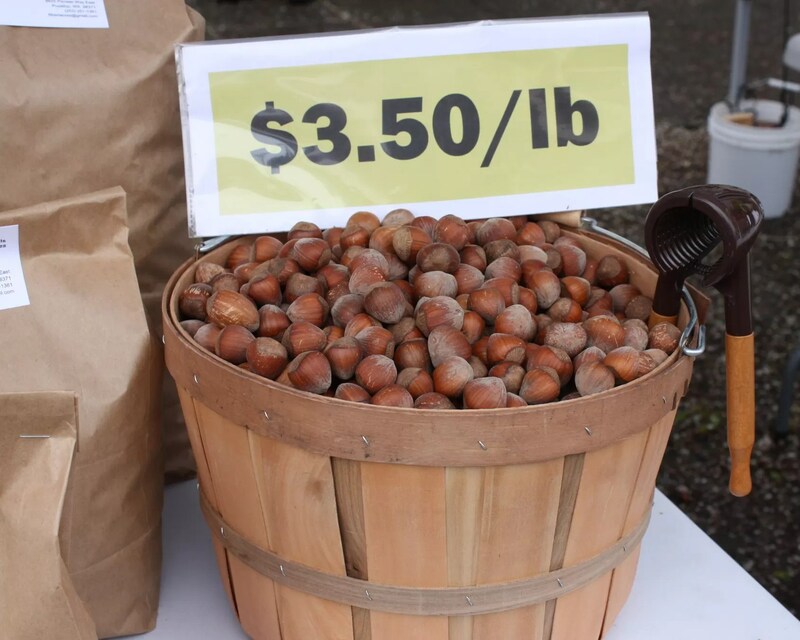 They had some gorgeous looking hazelnuts for sale. I would have bought them if not for one thing: I am lazy. I like my hazelnuts pre-shelled. I know, lame excuse. They said that they’re working on selling them shelled, but it requires all kinds of permits, licenses and special equipment. Alas. Maybe one day I’ll break out the nut cracker. I might have to. He gave me a page full of hazelnut recipes that I may not be able to resist trying. I am a complete sucker for empanadas. If I see them sold anywhere, I have to buy them. I just think they are the perfect food, all in a hand-held, perfect little package. These ladies have been getting some local media attention lately, and with good reason. 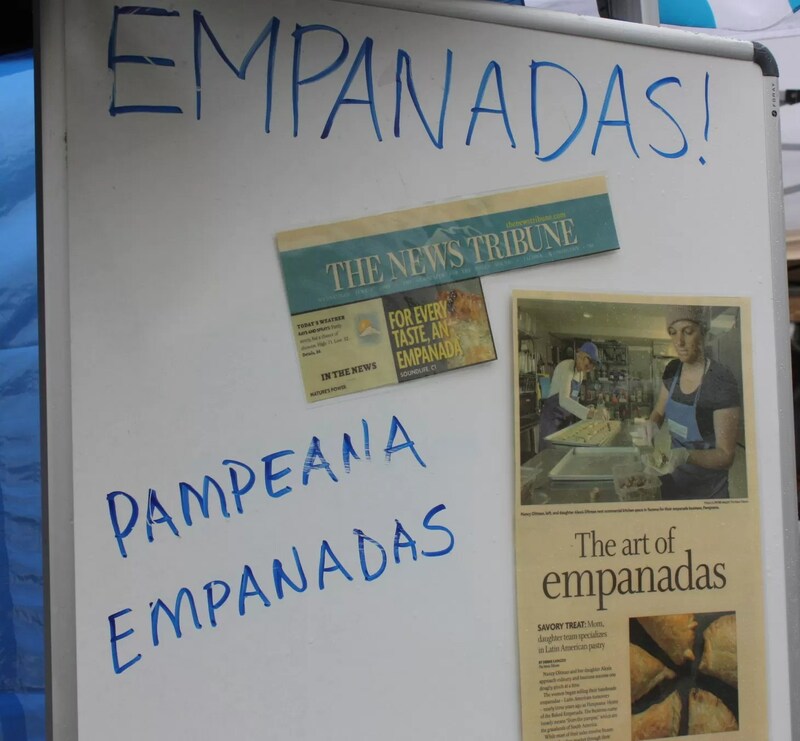 They make damn good empanadas. 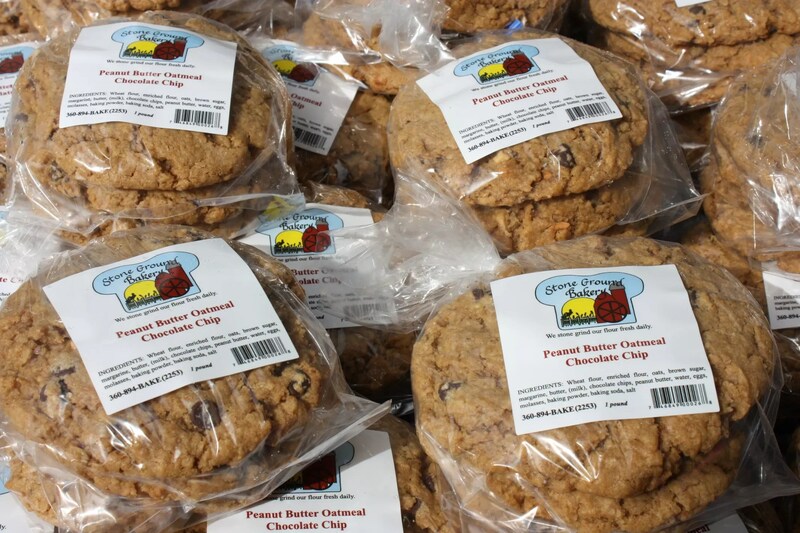 I was pleased to find out that you can purchase these beauties anytime at Kitchen2Kitchen (4312 6th Avenue, Tacoma) frozen, with baking instructions included. 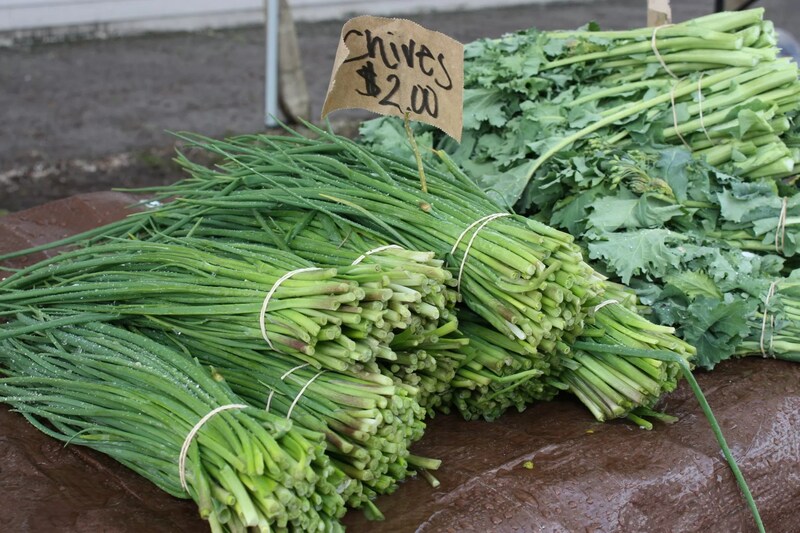 Buying them frozen is a more economical way than buying them individually and already prepared at the farmer’s market. But I couldn’t resist. I bought two chicken, two corn, one apple and one guava and ricotta empanada. Yes, I said guava. And by the look on Casey’s face when he ate the guava flavor, I’d say it was delicious. He even did a little jig after he ate it. I really enjoyed them all, but especially the chicken. It was nicely spiced, and has a great flaky crust. How could I walk by a table brimming with desserts and not stop? 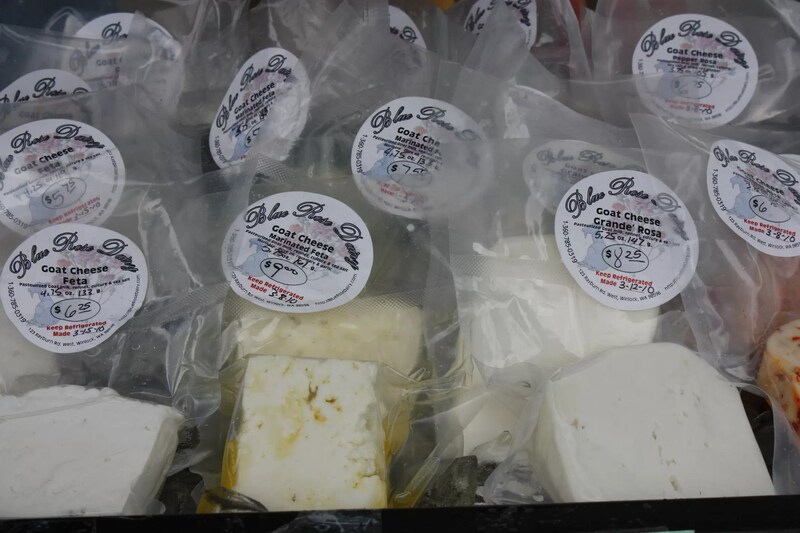 The Last Bite is a newcomer to the Proctor Farmer’s Market this year. She really had an incredible assortment of cookies and cakes. I bought something that looked like a brownie, but is much, much more rich and decadent. Goat cheese is such a versatile addition to so many recipes. 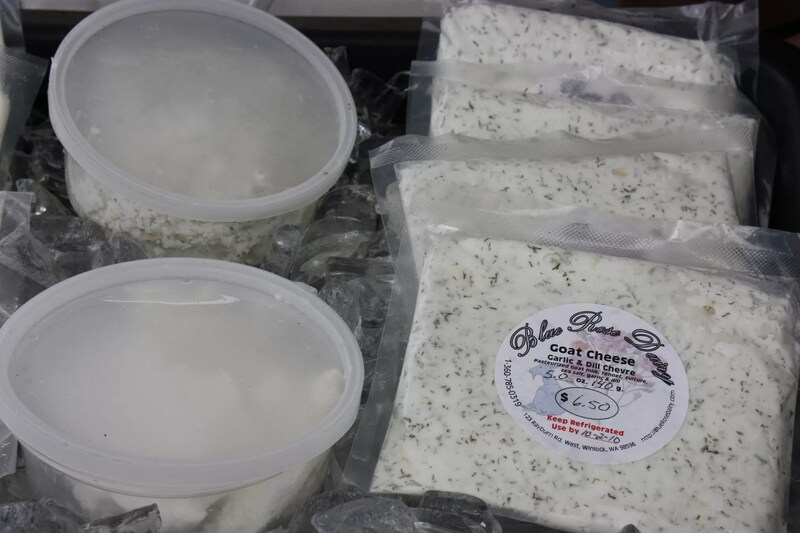 The guys at Blue Rose Dairy had an incredible assortment of cheeses, from Fresh Chevre, to Herbed Chevre, to Pepper Rosa, and Marinated Feta. I chose the Herbed Chevre. I know just what I’ll do with it. Tonight: Smoked salmon, chevre and chives on crackers. Tomorrow: Chicken breasts stuffed with chevre, prosciutto and spinach. I think this will be one of my favorite stalls to frequent each week…all those flavors are calling out to me. 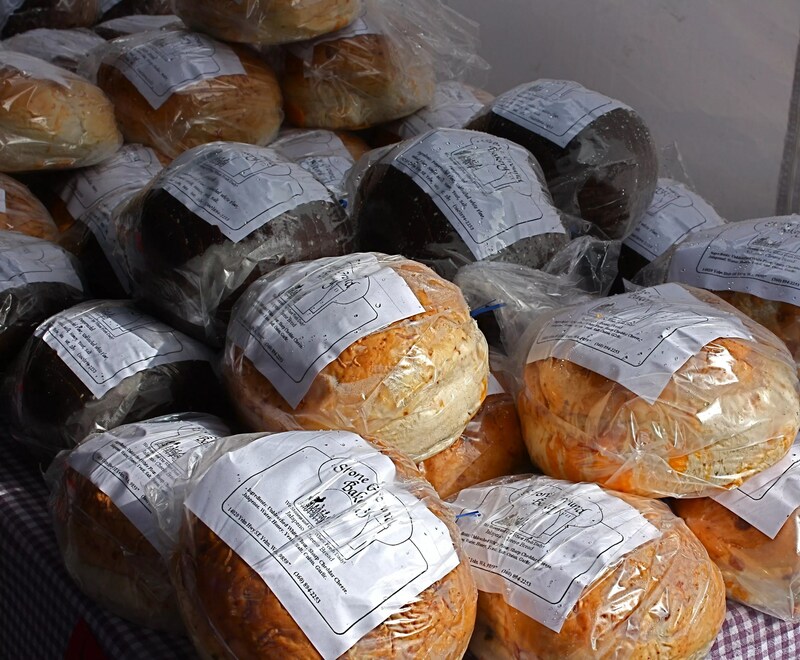 I can fondly remember last summer, buying Stone Ground Bakery’s Herbed Focaccia…and eating half the loaf. Okay, not one of my finest moments. But their breads are really wonderful. 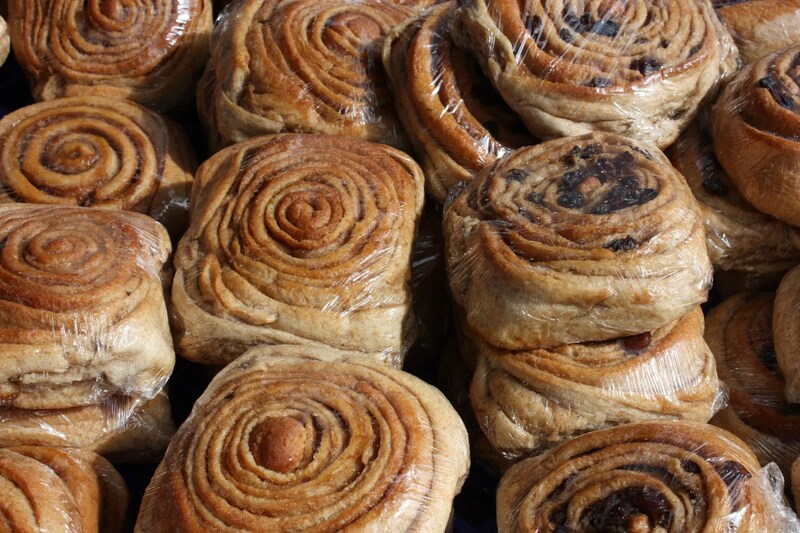 Today they had an impressive selection of not only breads, but all kinds of sweets. The sticky buns looks insanely good, but I resisted. Maybe next weekend. I did, however, purchase some Chocolate Chip Oatmeal Cookies. These cookies are huge. They’re giant. You can definitely split one with a friend, unless you are like me and just eat a whole one without realizing it. Shoot. One of my favorite things about the farmer’s market is the local meat. You can be hard-pressed to find locally raised beef in stores in Tacoma. 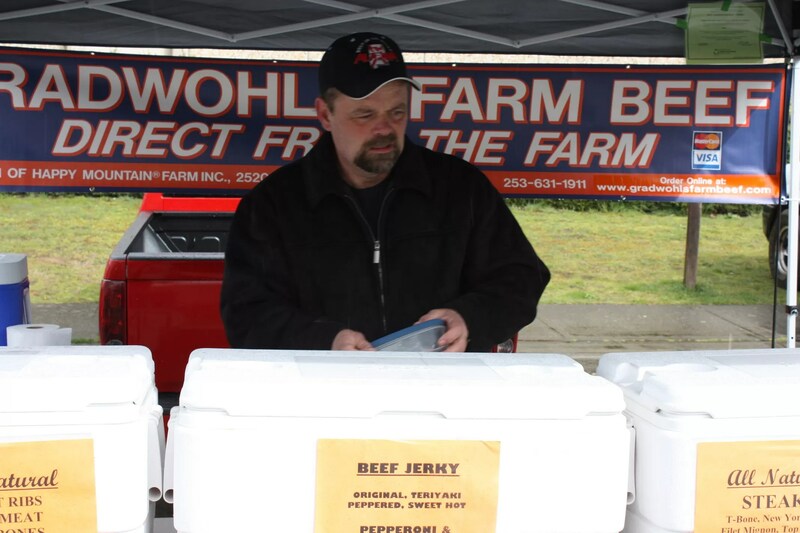 Gradwohl’s beef is consistently good, fresh and grass-fed. Their ground beef is a favorite of mine, since I don’t have to worry about the sketchier versions at the local stores. I like to stock up and keep it in the freezer so I don’t have to worry about getting it anywhere else. Wow, Adrienne, I am so jealous that you have such an awesome farm market in your area! At our local one, we’re lucky to get a decent variety of veggies, but farm-fresh beef and cheese and fresh pasta? Incredible! What a blessing. Update: I visited the market today, and a Proctor restaurant, Europa, was selling yummy sandwiches, pasta…and their incredible herb olive oil. It is the best blend for dipping bread into that I have ever had! It must have magical ingredients in it. Go get some! 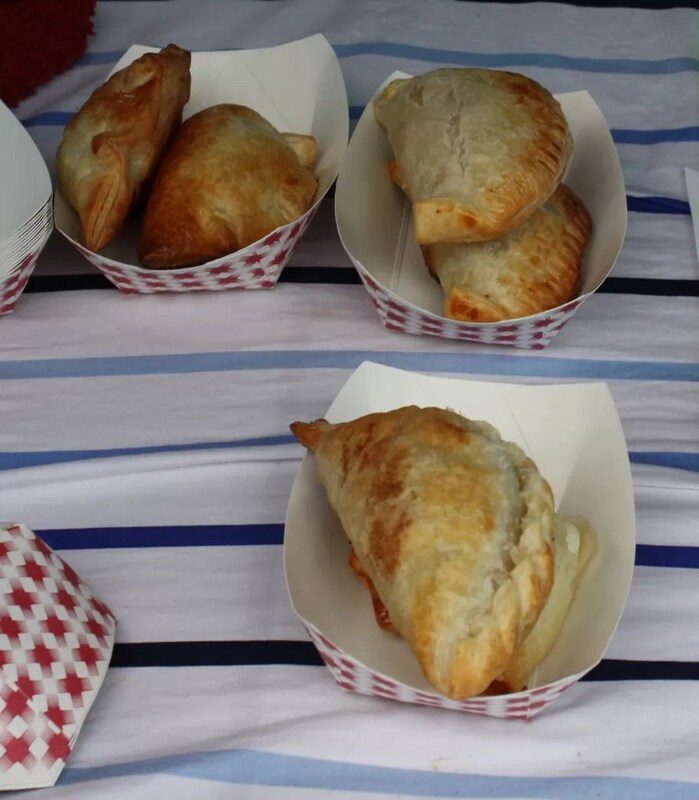 Thank you for the wonderful shout out to the Proctor Market vendors!